Stores compressed air as potential energy to supply sufficient air for large surge demands. When installing a lubricated trim compressor with load/unload controls, it is imperative to also install a wet receiver and ensure adequate total system capacitance. System capacitance is defined as total storage among all receivers and associated compressed air piping. A load/unload compressor, without a wet receiver, will experience shortened inlet valve and air-end life due to rapid cycling. This behavior will occur even when an appropriately sized dry receiver is installed in the system. The storage recommendation for lubricated compressors with load/unload controls is 5 to 10 gallons per cubic per per minute (cfm) output of the compressor. If the compressor operates load/unload and is a base-load machine, then ensure its discharge air flows through a wet receiver and there is adequate total system capacitance for the trim compressor. Other compressor control offerings from manufacturers include: modulation, variable displacement and variable speed drive (VSD). When not factoring in surge loads, these machines do not require any more than 3 to 5 gallons of total system storage per cfm output of the compressor. VSD machines require even less storage at 1 to 2 gallons/cfm depending on their turndown capabilities. A dry receiver is useful for storing clean and dry air. It can be located directly downstream of the air treatment equipment or anywhere in the facility to supply air for specific surge loads. Many dust collectors have dry receivers incorporated into their design to assist in partially satisfying their demand event. If located directly downstream of the air treatment equipment, a dry receiver can store air at a higher pressure than the plant requires and handle fluctuations in demand through a pressure/flow controller. This is useful especially if the demand exceeds the capacity of the air treatment equipment. The cycle frequency of a load/unload compressor depends on variables such as the pressure band differential, the total system capacitance, the load percentage of the compressor and most importantly, if a wet receiver is installed downstream of the compressor. When a wet receiver does not exist, the compressor will reload more quickly and more often than if a wet receiver did exist. This is due to the pressure drop associated across air treatment equipment. If there is a 5 psig pressure drop and the compressor operates on a 10 psig pressure differential, then upon the compressor unloading, it will quickly realize downstream pressure of 5 psig less than its unload setting. This artificially reduces the pressure band from 10 psig to 5 psig, and the compressor cycles twice as much. With a wet receiver installed, the pressure would not rapidly drop. The larger the wet receiver, the longer the compressor cycle time. The longer cycle time directly equates to a reduction in frequency of depressurizing the lubricant sump. For example, Figure 1 shows the energy profile of a lubricated compressor with load/unload controls. In this case, the compressor has roughly, a 90-second cycle frequency (30 seconds loaded, 60 seconds unloaded). Even upon being unloaded for 60 seconds, the energy consumption of the compressor decreased only 35%. The slow reduction in energy upon unloading is due to the compressor slowly blowing down the lubricant sump. More storage capacity is required to fully unload the compressor and to lower cycle frequency. The higher the cycle frequency, the less efficient the compressor runs at reduced loads, especially if it is a lubricated compressor. 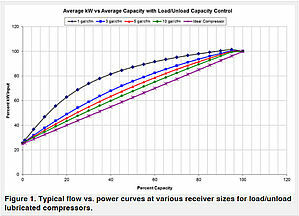 The changes to the power versus flow characteristics with changing storage receiver sizes are shown in Figure 1. 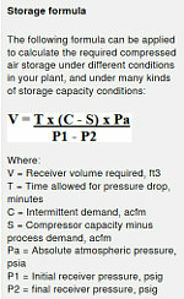 In addition, a lubricated, load/unload compressor can be more energy efficient than a VSD compressor when adequate storage is installed (Figure 2). The equation to size a receiver for a demand event of known duration is shown in Figure 3. To optimize the performance of a lubricated compressor running as a trim machine with load/unload controls, ensure a wet receiver is installed and that there is a total of 5 to 10 gallons/cfm of total system capacitance. Regardless of compressor control type, should the facility experience large demand events, install additional receivers as necessary near the location of the event(s). Use the equation illustrated in figure 3 to correctly size the receiver.